On World Sepsis Day 2018, Burnet Institute’s commitment to addressing this illness, which kills from 7-9 million people globally each year, and more than 3000 Australians, is stronger than ever. Sepsis is the body’s extreme response to an infection. It is a medical emergency, and unless quickly treated, it can lead to tissue damage, organ failure, and death. And the rate of death – one person every 3.5 seconds – is overwhelming. Burnet is playing an important and growing role, not only in Australia and regionally, but globally, with a broad range of sepsis projects, research, diagnostic development, and other initiatives that are making a significant contribution to life saving testing and treatment. 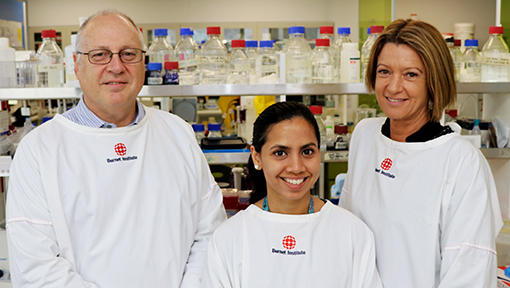 These include the development of a rapid point-of-care test with high sensitivity for the diagnosis of sepsis, which has attracted a Development Grant from the National Health and Medical Research Council, support from the Victorian Medical Research Acceleration Fund, and a Longitude Prize Discovery Award, as well as philanthropic support. Co-Head of Burnet’s Global Diagnostics Laboratory, Associate Professor David Anderson is excited about the potential for this highly effective diagnostic, which follows the earlier discovery of a new biomarker for sepsis. “We thought initially that we could make a test that would work around 80 percent of the time, which in itself could make a big difference, particularly in low- and middle-income countries,” Associate Professor Anderson said. Complementing this project is Dr Naomi Spotswood’s PhD study into neonatal sepsis, and how the diagnostic could be applied in neonatal populations. Another example of Burnet’s work in the field is a new study focused in Papua New Guinea into the use of chlorhexidine for umbilical chord care which dramatically reduces sepsis in newborns. “Our international development people have long recognised that sepsis is one of the big killers of people and especially neonates and young children in the developing world,” Associate Professor Anderson said. Find out more about Burnet’s work in sepsis.